i am sure these must be tasting damn good. 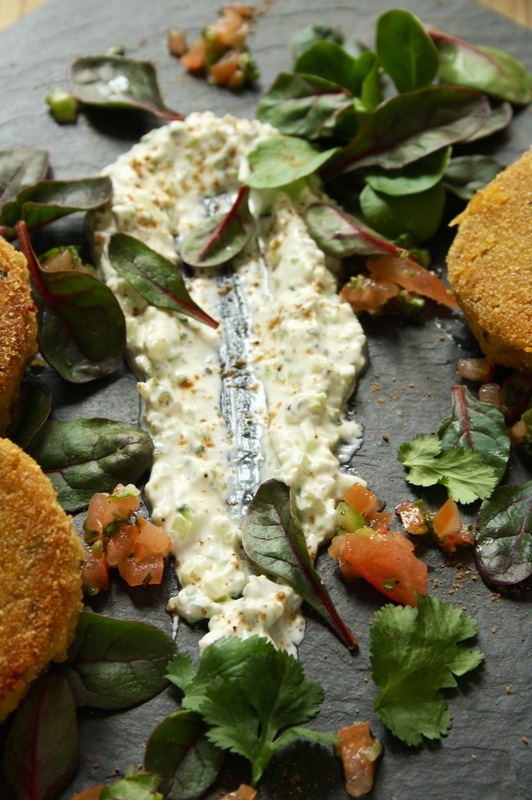 butternut squash and chickpeas cakes with a trio of salsa, raita, marmalade….. toooo good…. and lovely pics, natalie. They are so pretty and bloody well presented. 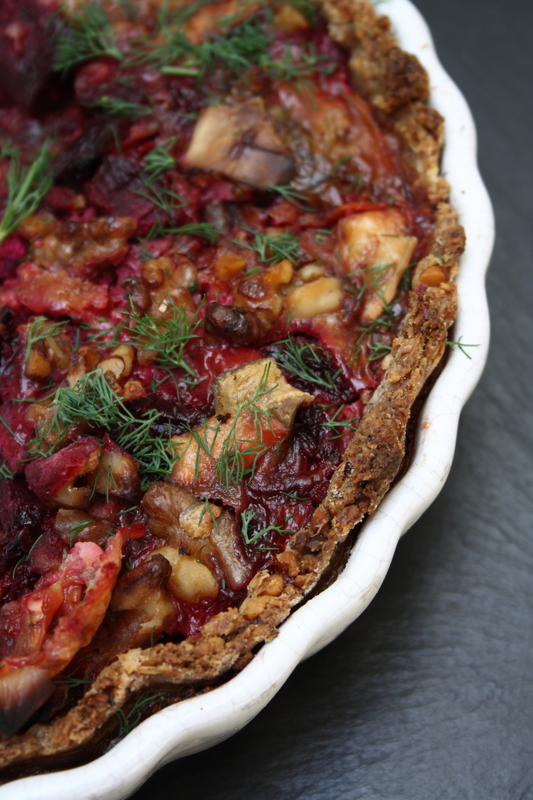 Delicious recipe too – definitely my sort of thing! This cakes are perfect, I love the flavor of it. Beautiful presentation! This is wonderful, I am going for the whole meal and all sauces. But then I really want to make the onion marmalade and then of course the tomato and chili salsa. I love your photos and presentation. Have wonderful weekend. This is one gorgeous meal. Your photos are stunning and really showcase this lovely meal. 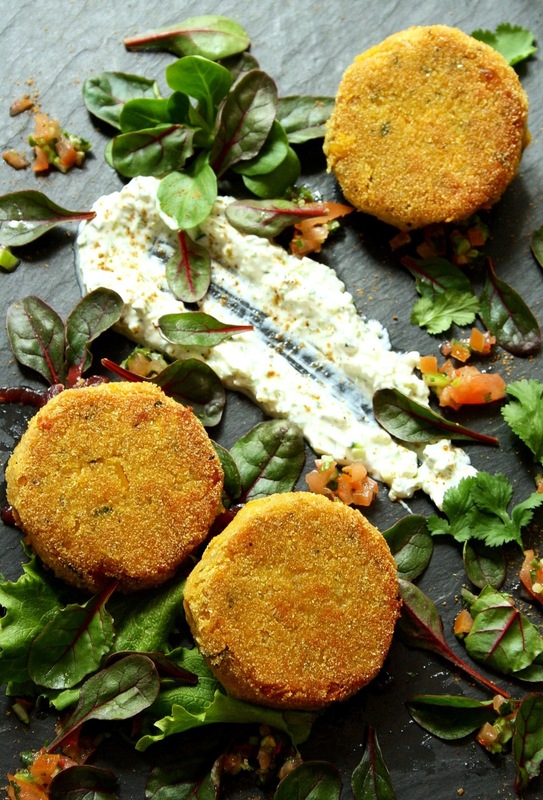 Beautiful – I often have problem with chickpea cakes as they tend to fall apart but I can see that made this way, they make a better mixt. 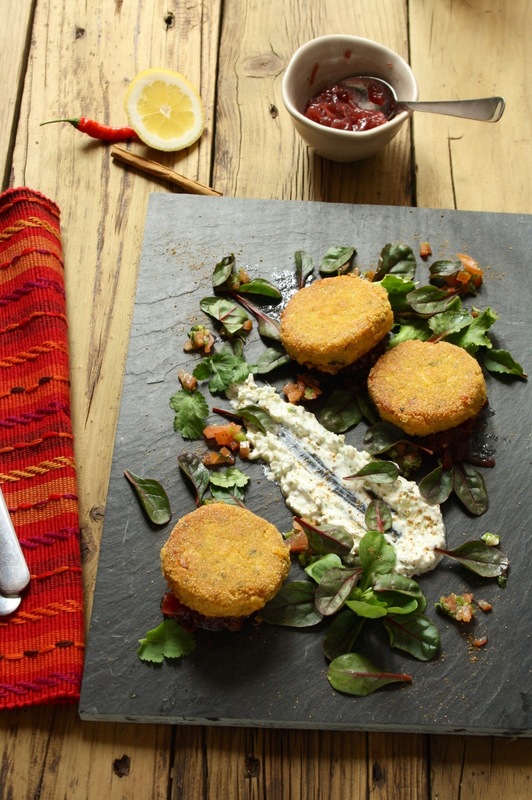 Love all the sauces too…I knoew you wouldn´t disappoint with your first post trip recipe! Your food is always a work of art. market which would be perfect in these. This looks delicious, and the photography is stunning! 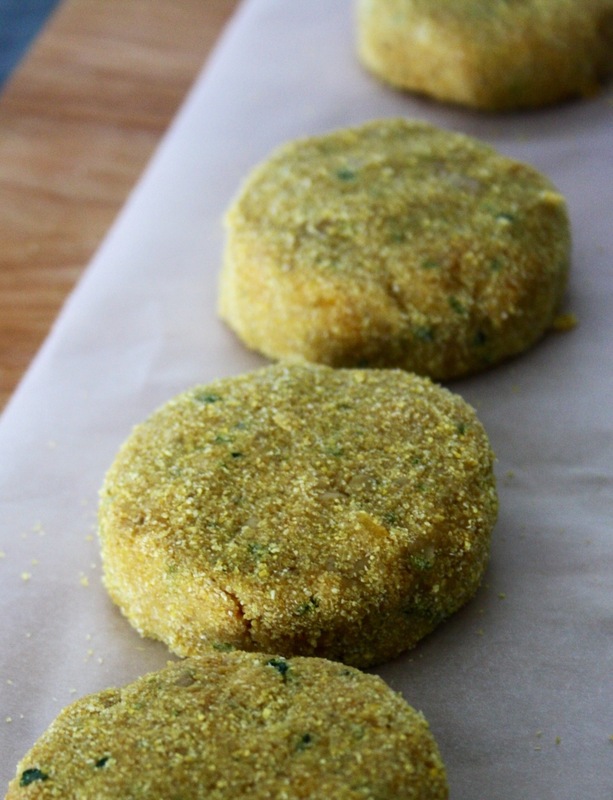 Looking forward to trying the squash and chickpea patties. These cakes are genius! I love butternut squash, and the flavors you paired with the cakes sound just perfect. Gorgeous pics and gorgeous food! I will bookmark for when butternut squash is back in season. Oooh.. what a gorgeous presentation! I just happen to have some leftover roasted butternut squash in the fridge… wonder if there’s enough for me to use for these cakes. I have a feeling these taste even better than they look! These sound seriously amazing! I am loving all of the ingredients you have combined in these cakes especially the squash! Congrats on the Top 9 :)! Sounds delicious! And your photos and food styling are both absolutely amazing! First – your pictures blew me away! I love chickpeas and am trying to branch out on what I use them to create. I love the sound of these little cakes and can see me really enjoying them! Can’t wait to try these scrummy cakes! 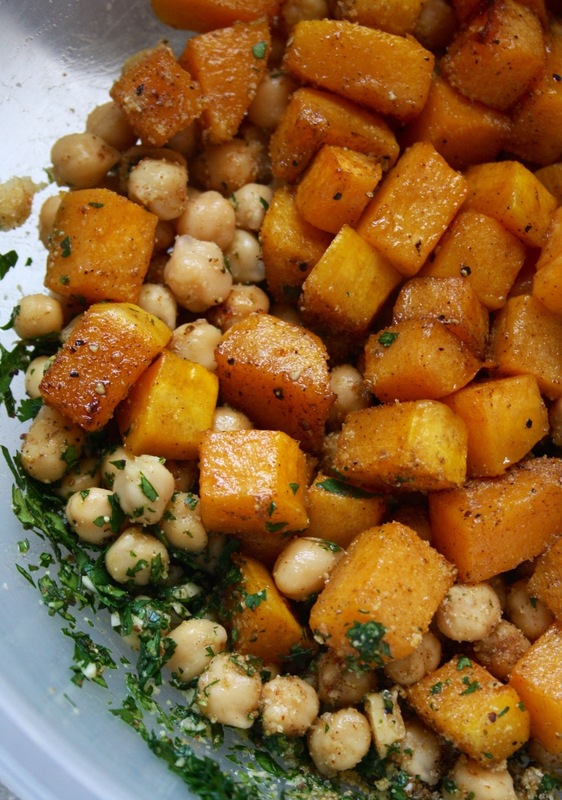 Could you substitute sweet potato for the butternut squash in a pinch? Thank you Natalie for the wonderful South African Food & photo tour! Absolutely Brilliant! I found you via foodbuzz, and these look amazing! I just made a butternut squash and chickpea flatbread pizza recently, funny enough. This is another great twist on the two ingredients. I will definitely be making these. Thank you! I just found your blog and really like your recipes and pictures. I am vegan so I wonder if you have any suggestions on what to use instead of the egg? I am making your cabbage,leek,potato soup tonight (we have had lots of rain too)! Hi Chris, I think these may be ok without the egg you know. You may have to add a few more breadcrumbs/polenta to make it hold but it shouldn’t be too much of a problem. 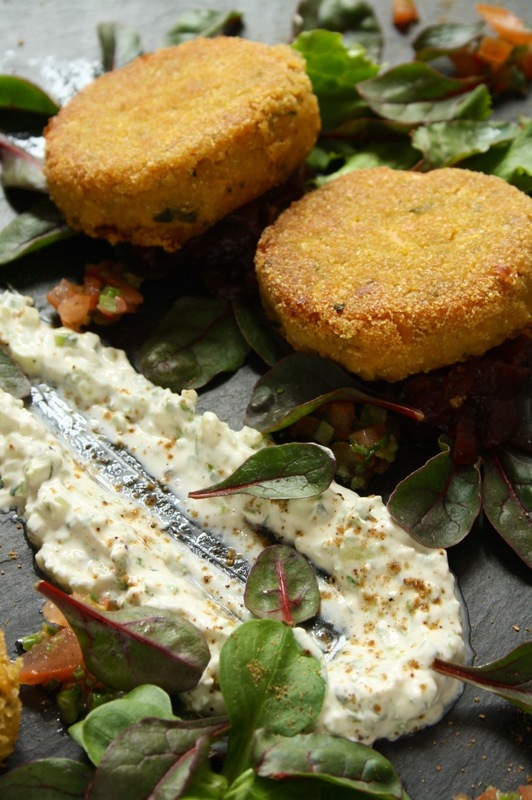 I hope you enjoy the soup tonight, let me know how it goes if you try the squash cakes!! These look delicious! I’m saving your recipe! These look so good and not to mention I’m a sauce spaz- this has my name all over it! Made these for dinner tonight and they are delicious. We’re not vegetarians but I’m delighted whenever I find a satisfying vegetarian recipe we both enjoy and find satisfying. I’ll definitely make these again. I didn’t have any lemons so I had to substitute white vinegar in places, and that worked fine. I’m so glad they worked out & you enjoyed them so much! It is my mission to get meat eaters to realise that vegetarian food isn’t boring & can sometimes actually be better than a meaty meal, so thanks!! Made this yesterday for Valentines dinner – absolutely superb! thank you so much, so easy to do and so tasty! So glad they were a success for valentine’s! They are one of my favourites! why would you condone using ANY form of Palm oil/sugar any thing?As a vegetarian surly you are aware of the genocide of millions of Urangutans and other animals due to this horrific Palm industry? Hi, this looks amazing. How long does the marmalade keep in the fridge approximately? 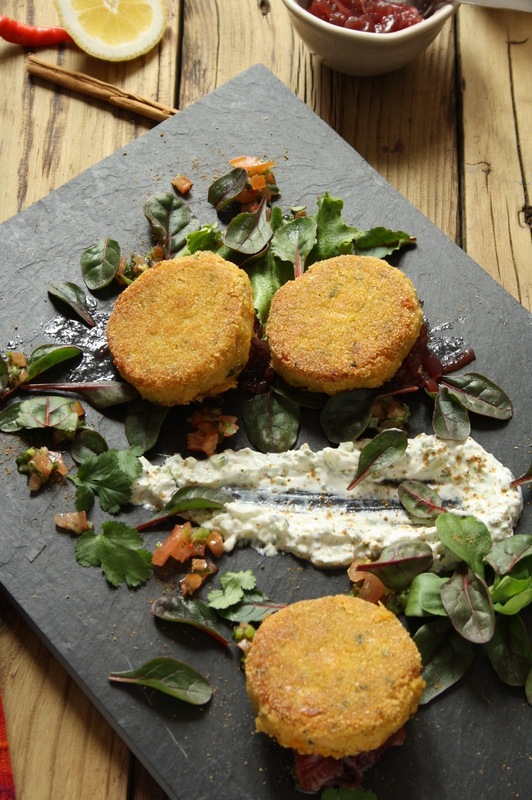 What a fantastic looking vegetarian dinner idea. I am always on the lookout for things to cook for guests, that are more impressive than the usual things I make for quick dinners, and this would definitely impress.